Premium Poly (faux wood) blinds are a low-cost alternative to real wood blinds. 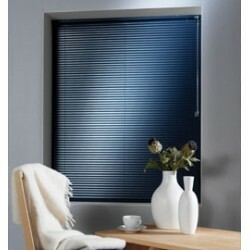 Created from high-quality, man-made materials, Poly blinds are a great investment for your home. Choose from a wide variety of colors, stains, and grains to make them pop against your current decor or to create a matching scheme. Poly Blinds can withstand humid climates, won't swell, and acts as a natural insulator, so it's a perfect choice for a range of different environments. Get an upscale look with 2” Poly Blinds, replicating the unique style of real wood at an economical ..
2 1/2” Poly Blinds have a tighter blind closure and offers more privacy. The wider slat provides a c..